Game of Thrones recently returned to TV for the first time in over a year, and the show’s season seven premiere, “Dragonstone,” has been the talk of the interwebs all week long. One particularly noteworthy element of the episode was a cameo from famed pop singer-songwriter Ed Sheeran, whose brief (if conspicuous) appearance on the show drew so much vitriol from fans online that Sheeran actually quit Twitter. “He was appropriate for the part because he needed to sing,” the director argued. “If people didn’t know who Ed was, they wouldn’t have thought about it twice. The hoo-ha seems to be from things that are outside of the world of the show. 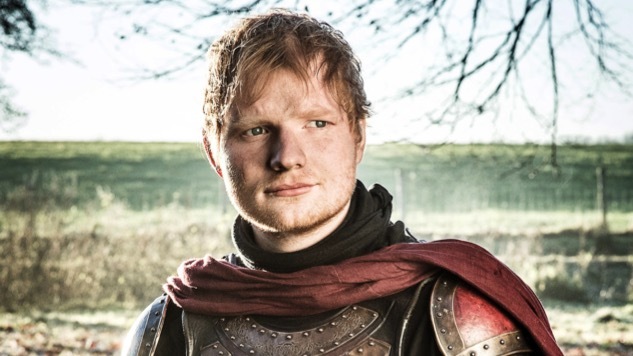 In the world of the show he did a lovely job, and he looks like he belongs in that world.” Podeswa has a point there, actually—Sheeran does have a certain Westerosi look about him. Podeswa will return to direct the show’s season seven finale, making that his sixth episode of the series—the HBO veteran also directed “Kill the Boy” and “Unbowed, Unbent, Unbroken” in 2015, and “The Red Woman” and “Home” in 2016. The Podeswa-helmed “Dragonstone” was HBO’s most-watched season premiere of all time. Watch Sheeran’s “Dragonstone” cameo here, and find our review of the season premiere here. Game of Thrones returns with this Sunday, July 23, with another new episode: “Stormborn,” directed by Mark Mylod. Watch a preview below.